We did not hear about Google Official Blog very often recently since Google released many other great products. But we want still to record the Google Official Blog stuff since we did not have related information. Google’s official Blog was built on their own blog platform BlogSpot. The sub title is “Insights from Googlers into our products, technology, and the Google culture”, which is interesting for all Google fans all over the world. The last month we had Alexa Ranking record. 30 days passed, now how our website’s ranking is? We mentioned we came back to maintain GoGoToTo.com, now the visiting traffic is better and better. The Alexa ranking was 1,918,259 in last month. (update on March 04, 2016) Our WordPress blog sites got countless junk comments often. The big amount of junk comments were saved by WordPress into database automatically and caused MySql data tables large sized. We could delete junk comments manually, or we install some plugins to help us, for example the plugin Akismet can protect our site from spam. It is a default and recommended plugin in newer edition of WordPress. However, no matter which way, if you set you will review all comments manually, the junk comments will still occupy your database space, your data tables are still huge. So, what you can do is deleting useless comments manually one by one or use another “rude” way which is deleting all records from comments data table. We mentioned we created too many categories on our WordPress blog site since we kept posting in passed 10 years but did not have good time to maintain entire website structure. Now we have to finish multiple tasks. Cleaning up existing categories is the one of important tasks. Our current WordPress edtion is 4.4.2 which is the newest one currently. We thought it has already provided the Category moving function but actually it did not. Delete a WordPress Category Will Delete Posts under It ? Sometimes we realize we have created too many categories in a WordPress blog site since several years passed. So we want to remove part of categories, but how about our posts which have been set to under the category ? Will they be deleted with the category ? The answer is No. you can delete a WordPress category, but your posts which related will be kept, but the posts will be move to the default category automatically. We posted How to Display OneDrive’s Images in Web Page, we think Microsoft’s OneDrive can be a good choice for storing image files and using its great technology to generate embed image HTML code. That kind of result is just what we wanted, it is very good to embed images in our blog articles. Now we are going to try another popular Cloud Storage Service giant, Google Drive. We often need images in our web pages such as in our blog articles. One image could win hundreds description type text in an article; It presents out the topic directly and clearly, and readers can understand the topic easily. Normally bloggers submit several images with text together in an article onto blog site hosting server, which could store the text and related images files tightly, avoid missing the image files. However, in some cases we can not let image files stay with our blog article or web page content together, or we do not need to. Many many bloggers in this world are using Microsoft free Windows Live Writer as their blog website’s offline editor tool. They love it very much, and Windows Live Writer has been the best blog offline editor for free in the world. But after Microsoft released Windows Live Writer 2012, they no more had newer version, no more updated the Writer. Until the 2015 Dec, a great news came to all bloggers on Dev 09, 2015: Microsoft announced they open sourced Windows Live Writer. There were also a group of volunteers who came from Microsoft and other places would maintain the open source Writer, which they called the project as Open Live Writer, using their spare time. We tried to upload an article to remote website with some pictures in the content. The article edited in Windows Live Writer. The website is a WordPress site and the version is 3.1.3. However, we got an popup error message windows indicates Picture Upload Not Support By Blog as title and pictures can not be published. The error windows also provides solution: Windows Live Writer can be configured to publish pictures to an FTP account. 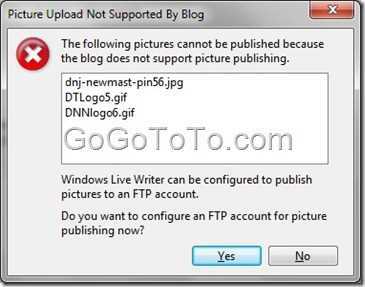 Do you want to configure an FTP account for picture publishing now? Actually, This issue is not about any FTP stuff. It is because some settings on your WordPress blog are not correct. Login to your admin control dashboard. Go to “Settings”, click “Media”, we found we put a Store uploads folder for uploading files. actually, we should not input anything here, because the default folder works always well, it is wp-content/uploads. So the solution is just remove the folder setting so that let the blog uses default folder.